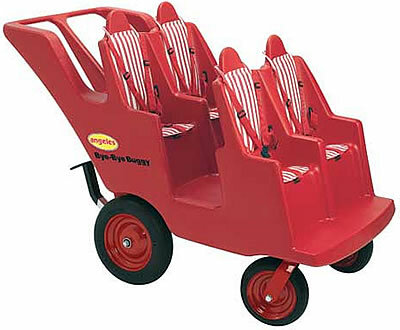 Bye Bye Buggy USA is happy to bring you the original Bye-Bye Buggies from Angeles, the industry standard for transporting multiple groups of kids at schools, day cares, preschools, and other child care organizations. 360 degree pivoting front wheels for easy maneuvering. Two types of wheels are available: slim and fat (add $50 to the price for fat wheels). Terraced seating — every kid has a full view of all the action! We’re standing by to help you with any questions you might have about 4-Seat or 6-Seat Models of Angeles Bye-Bye Buggies. Just phone us toll free at (877) 840-0707. 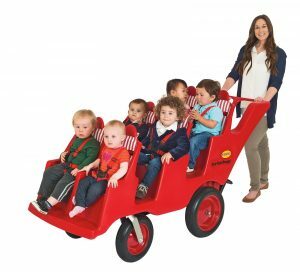 We don’t just sell these items — we work directly with hundreds of schools and day cares in our own geographic area, so we’ve got the experience you need to help you with any questions you have about the buggies.